Got a Marvel costume? You could be featured on Marvel's Facebook page. Quick, grab your spandex and your capes! Halloween is approaching, and cosplayers are equipped with an array of costumes. 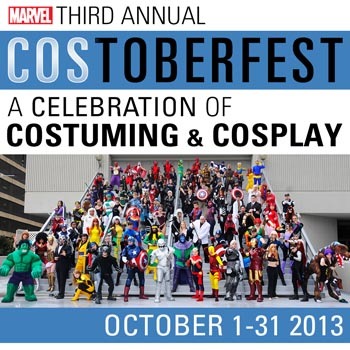 To celebrate the costuming holiday in one month, Marvel will feature cosplayers each day of October on its Facebook, Tumblr, and Twitter pages for the third annual Costoberfest. Interested participants can email photographs to [email protected] with a signed release form - provided by Marvel - and approval from the photographer. All photographs must be of cosplayers at least 13 years old. Submissions can be of individuals or groups. The key is that the photos feature only Marvel costumes. Marvel will also feature cosplayers through profiles, news articles, and events. The feature is open to cosplayers around the world. Costoberfest also takes place during New York Comic Con, which always has plenty of cosplayers dressed up from comic book series. Marvel will likely have their own setup at the convention where cosplayers can pose in a photo-op. Marvel also announced "tons more cool things" will be announced during the week of New York Comic Con. Photos of the 2011 Costoberfest are available here, and photos of the 2012 Costoberfest are on Marvel's Facebook. How many Deadpools will we see this year? A word of caution to interested cosplayers: photos posted by Marvel will draw many comments, some of which are not constructive.